Made especially for Automated Cleaning. Gives cleaning staff the ability to fully clean unit without bacteria lingering. Impervious to most cleaning products. More, the model PCB-CSS1200B was custom designed for a patient study at a major US hospital. The unit was found to be able to handle 99% of that large hospital's patient population! Click Here To Learn More About This Exceptional Shower Commode Series! Constructed with 1” Anodized Aluminum tubing and a 7/8” inner liner for double wall tubing throughout for double strength. Anodized Aluminum and stainless steel fasteners prevents rusting. Easy Lock and Unlock braking system on back casters. 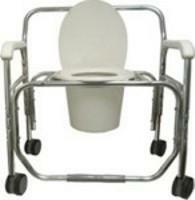 Fits over 19” commodes. Back is angled for easy pushing and pulling. Contoured arms and vinyl heel rest standard. We have added 4 additional inches of seat depth to the 1328 Series and an over-sized Perineal Opening to compliment the extra wide shower chair. Optional safety belts are available. Caster installation is required before use. This Shower Chair is now available in 3 seat widths; 24”, 26” and 28”. Seat is non-padded. This will minimize transfers for toiletry and bathing. 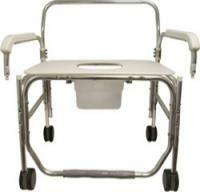 One transfer from the bed to shower commode chair reduces the risk of injury to both the staff and the patient. 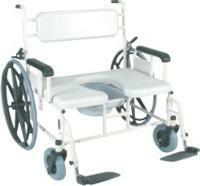 The 24” wheels and 8” casters make the chair much easier for the care giver to push and maneuver. Features include a rigid corrosion resistant frame for durability and Beachwood powder coat finish. Other features include removable arms, attendant mount rear locks, integral rear anti-tippers and removable footrests. 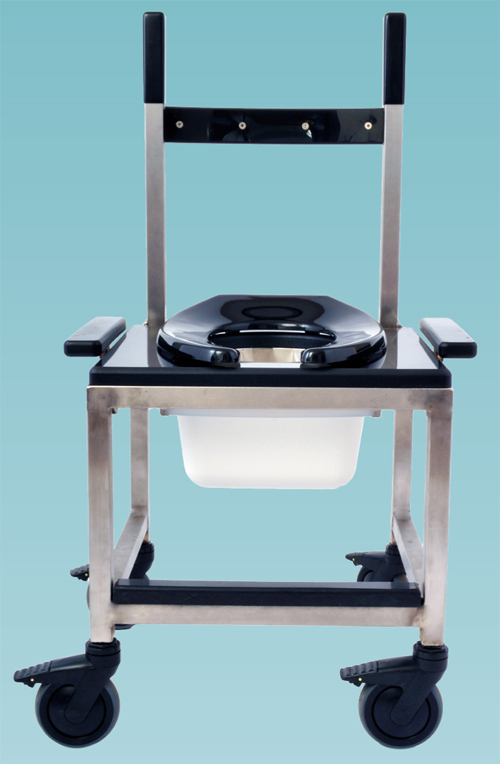 Front opening allows for hygiene access and 22" seat height allows positioning over a conventional toilet. Constructed with 1” Anodized Aluminum tubing and a 7/8” inner liner for double wall tubing throughout for double strength. Anodized Aluminum and stainless steel fasteners prevents rusting. Easy Lock and Unlock braking system on back casters. Fits over 19” commodes. Back is angled for easy pushing and pulling. Contoured arms and vinyl heel rest standard. Optional safety belts are available. Caster installation is required before use. The Model 1326 is not designed for use with a pail.